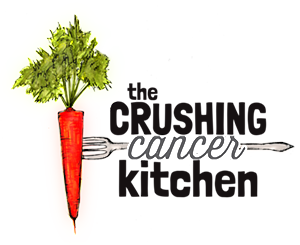 The original recipe was given to me by my Mom’s Naturopath when she was going through cancer treatment. I have changed it around a bit and added some chia seeds for extra fiber and fat to slow down the (natural) sugar absorption into your bloodstream. 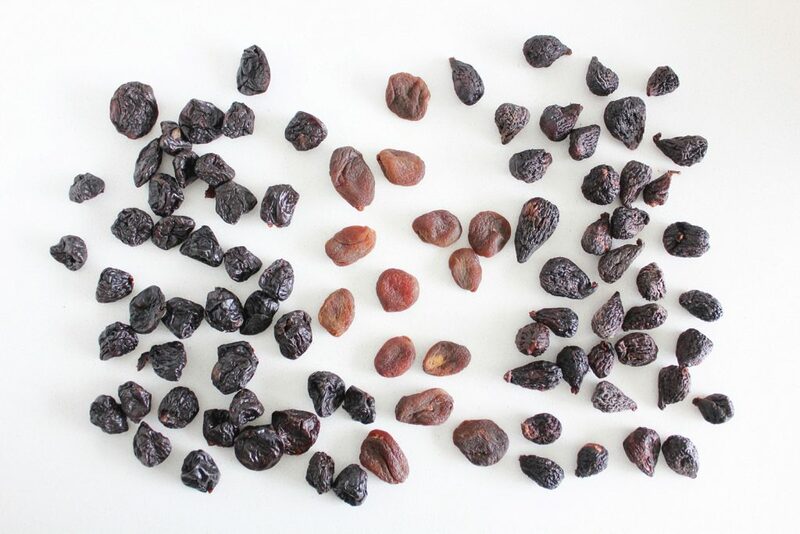 It couldn’t be a simpler recipe to make; all you need is the (sulphite-free/organic) dried fruit, chia and a blender or food processor. You don’t even need measuring cups (or talent), it’s a very forgiving recipe. 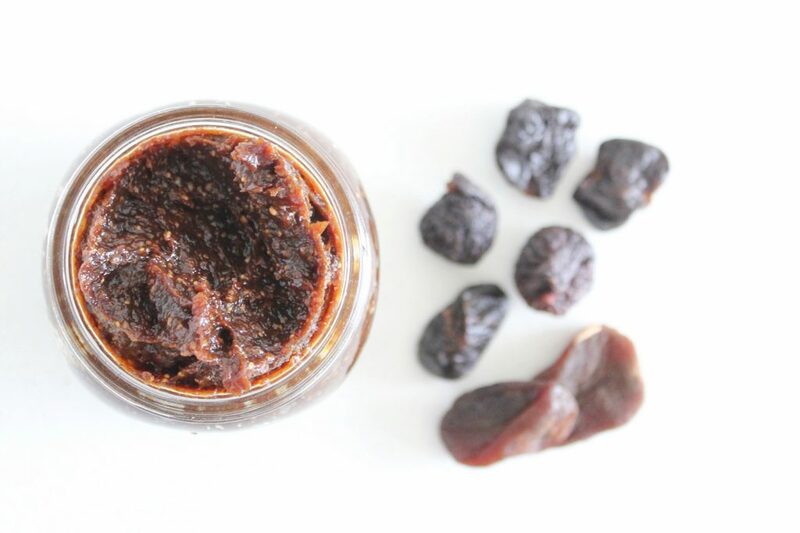 The prune/fig/apricot combo is absolutely packed with fiber. The water that you plump them up in actually helps them help you (and your constipation), and your blender, by softening them. 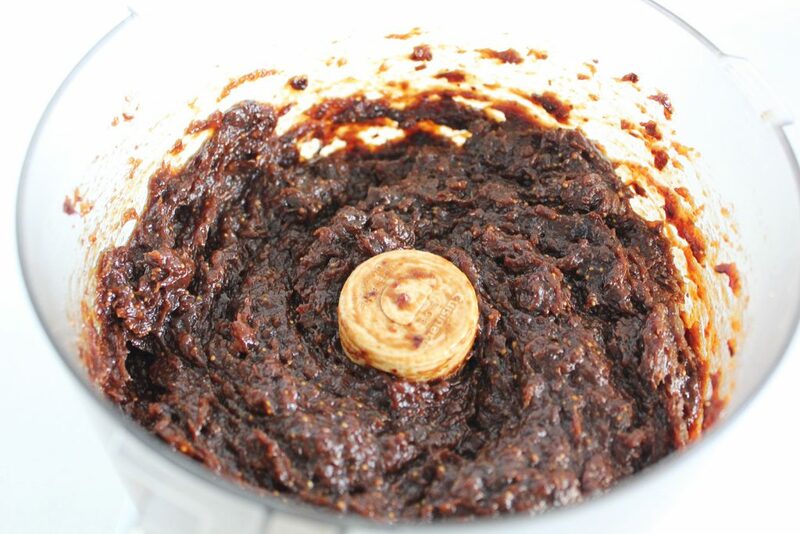 This jam is also full of iron, something we often lack while going through cancer treatment (or pregnancy…) It is also rich in beta carotene (precursor to vitamin A) and the figs bring essential fatty acids (omega-6 & 3) in the seeds and a good amount of calcium. So what do you do with it (besides eat it off a spoon)? It goes exceptionally well with nut or seed butter, stirred into your Chia Pudding or Coconut Yoghurt and for when you’re feeling fancy, it’s pretty delicious on a nut-based cheese platter. OR! 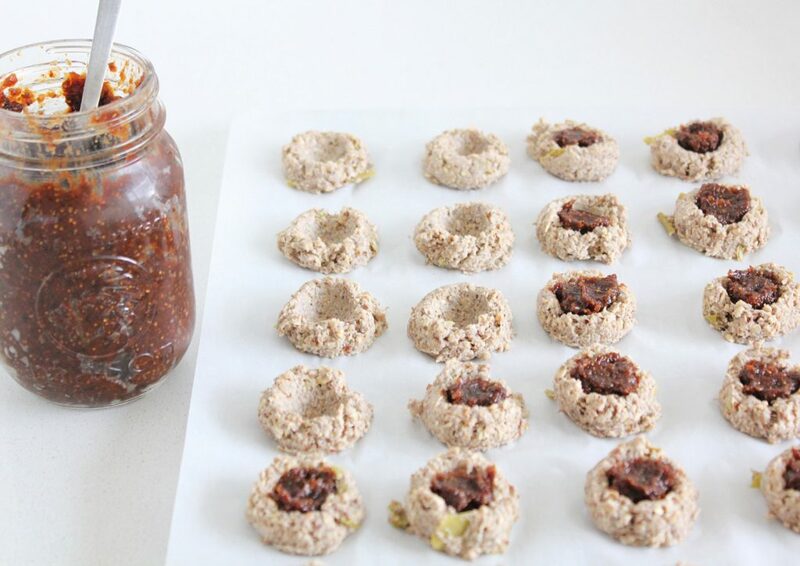 You could turn them into these easy to grab and go thumbprint cookies. 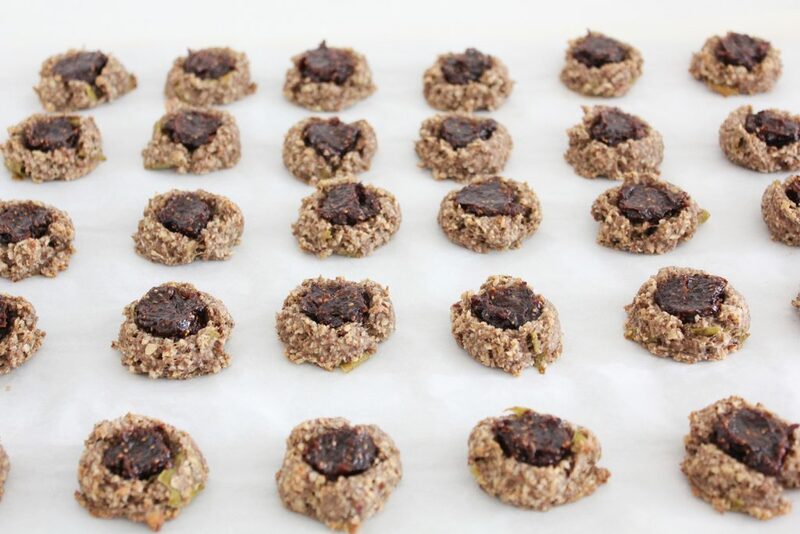 The recipe for these is a spinoff of the recipe created by Angela over on ohsheglows.com. 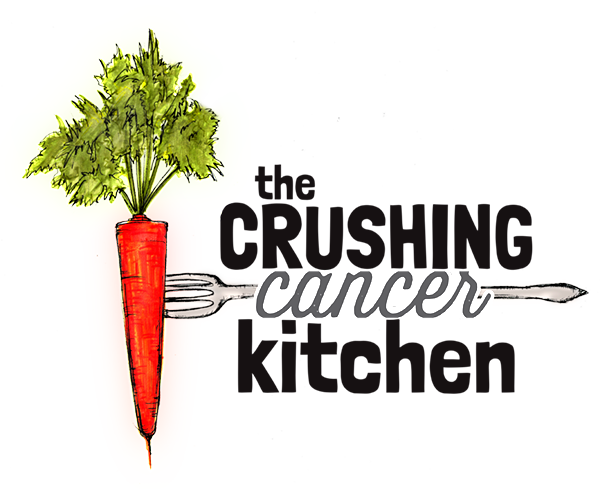 I twisted it around a bit to make it a little more health promoting/cancer-fighting specific. They are great though, and not too sweet or addictive to make you (or your partner/roommates) eat them all before they cool. Which is probably for the best considering the fiber they are packing. 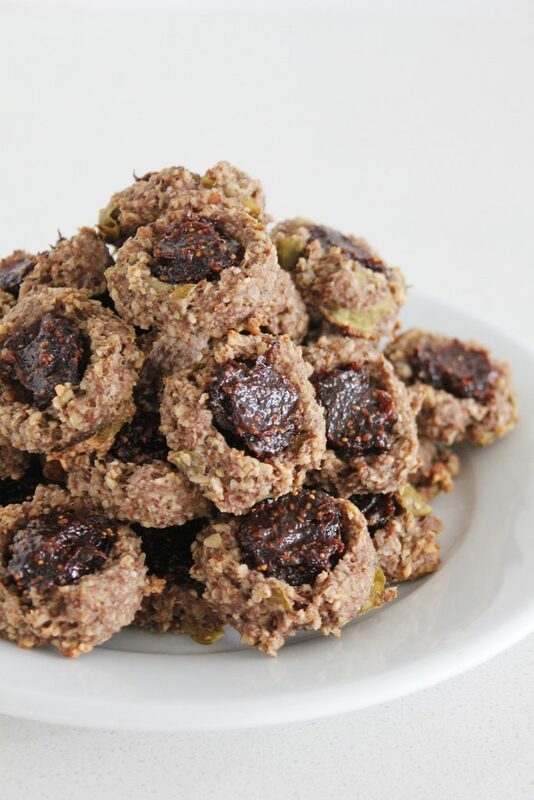 I have made them with many different kinds of nuts and both pumpkin seeds and sunflowers seeds. 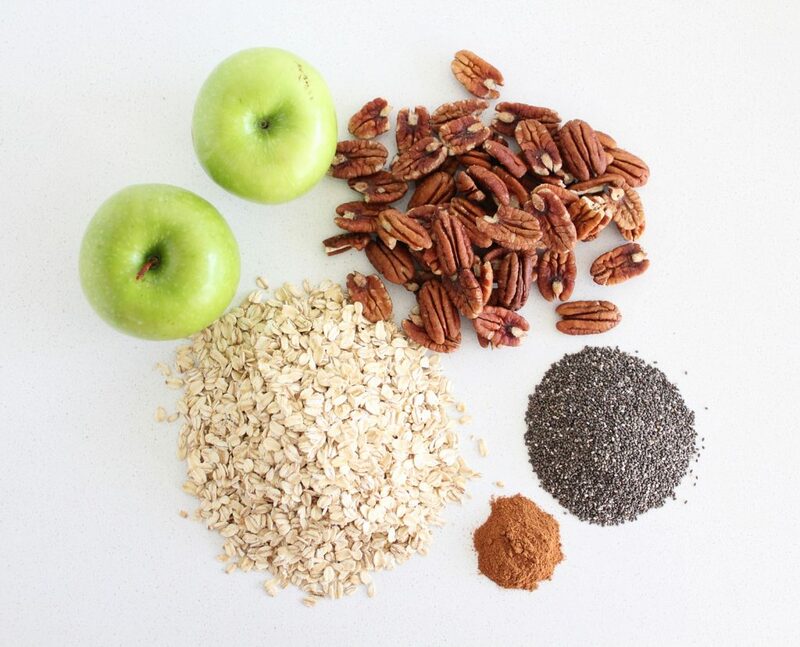 My fave is with the pecans because they are so rich and caramel-y tasting and pumpkin seeds, if you need to be nut-free or want some extra zinc in your life (combos work too). The only sweetener is cooked apple (we made our own, leaving the skin on for extra nutrients) but feel free to buy applesauce, just make sure the only ingredient is apples. I store these in the freezer and pull out a few days worth at a time and keep them in the fridge. The jam freezes well too and although it seems like it should, it doesn’t last forever in the fridge, so make sure you freeze what you don’t think you’ll go through in a week or two and pull it out as you need it. These are both great recipes to make and freeze before you start treatment so that they are there waiting for you when you need them. Besides helping out with constipation, they are also just very good for digestive health and promoting regularity. Don’t forget the jam tastes really good regardless of your colon motility, so make sure you make extra to freeze/hide if you live with someone who will think they hit the jackpot when you make homemade fig newton-tasting jam. 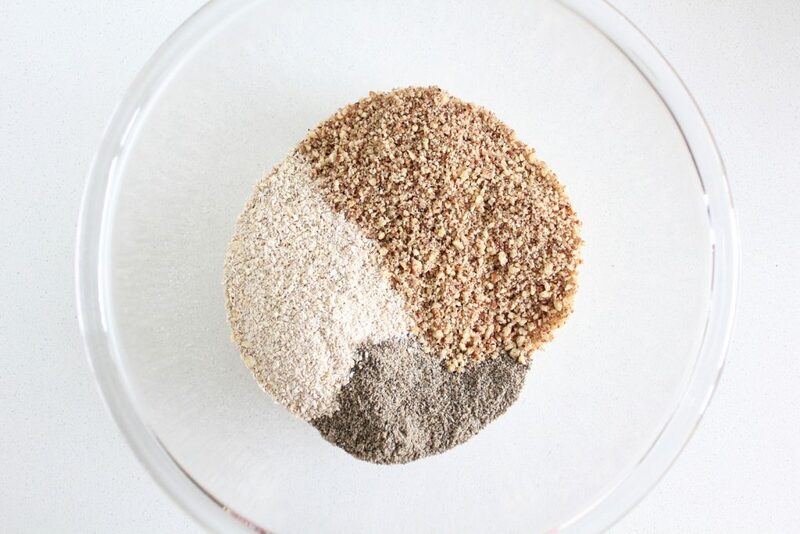 3 Tbsp Chia Seeds, ground in a coffee grinder or dry blender. 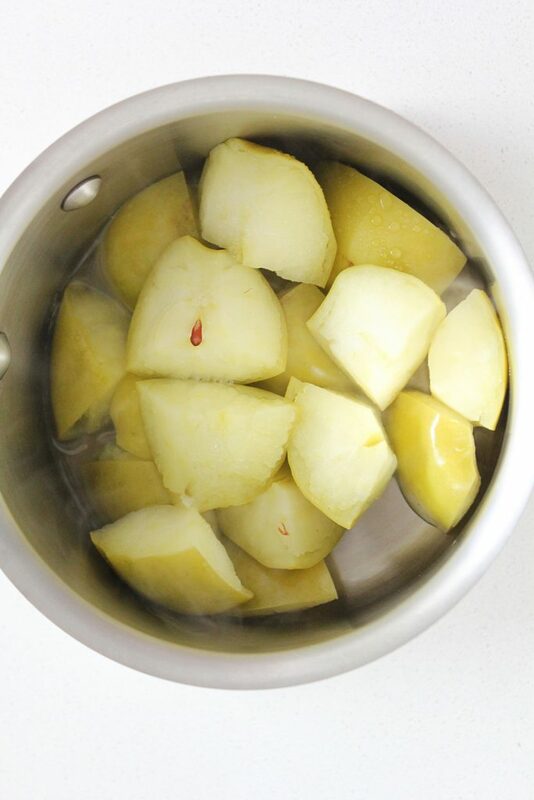 In a pot, bring the water to a boil and turn the heat off right away. Add all of the dried fruit, put a lid on top and let sit for 5 minutes or so. 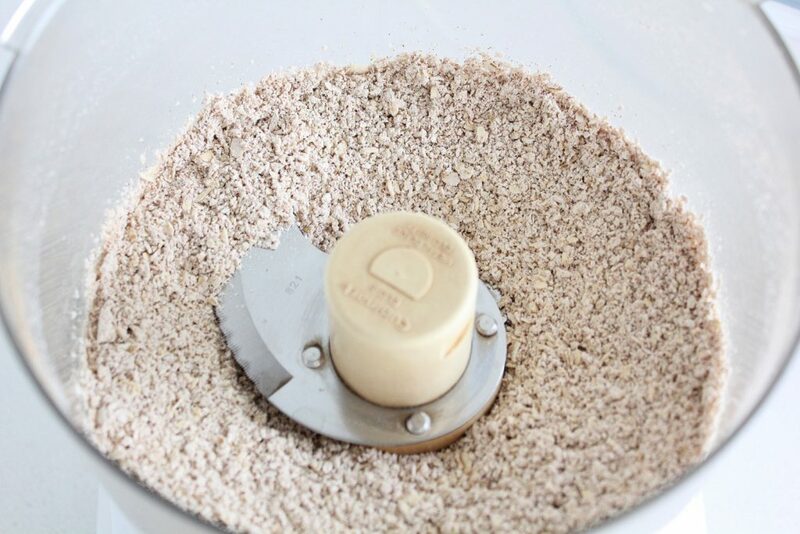 Transfer the entire contents to a food processor and blend until desired consistency (a little chunky or smooth). 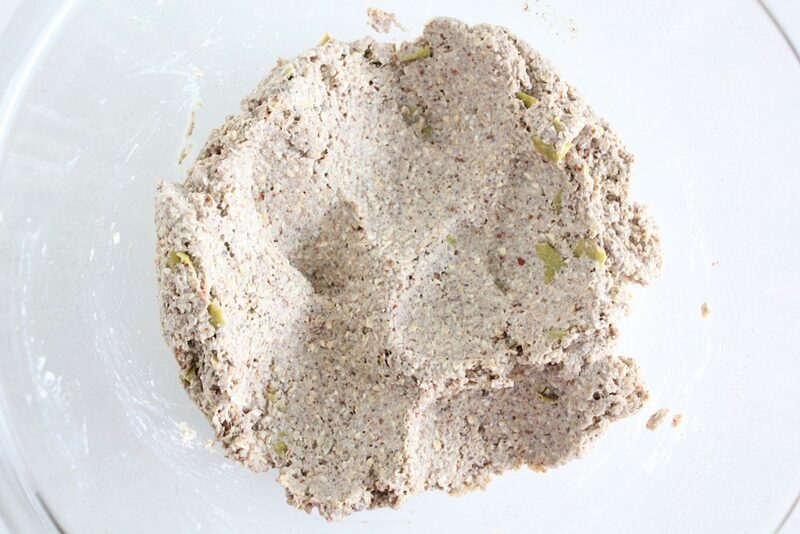 Add the chia seeds and turn back on to mix until well distributed. Transfer jam to jars and store in your fridge (keeps for several weeks) or freeze for a later date. Recipe makes about 3.5 cups. 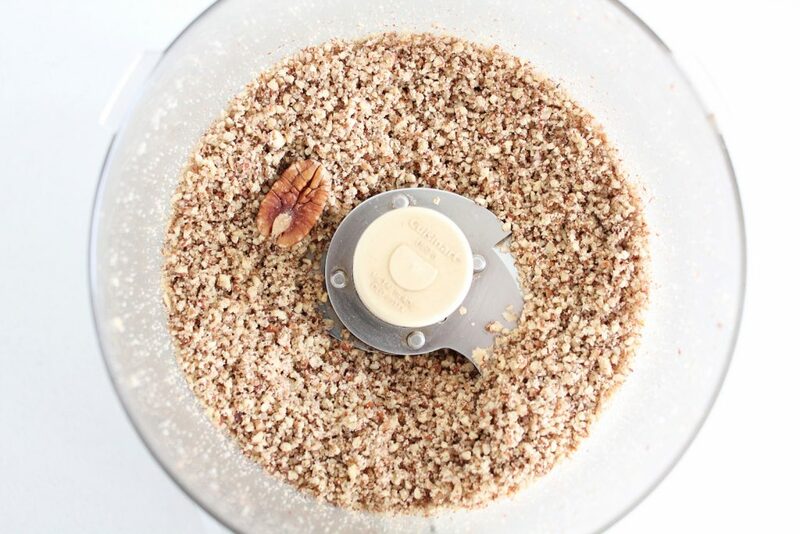 In a food processor, blend the oats, cinnamon and salt until they become fine. 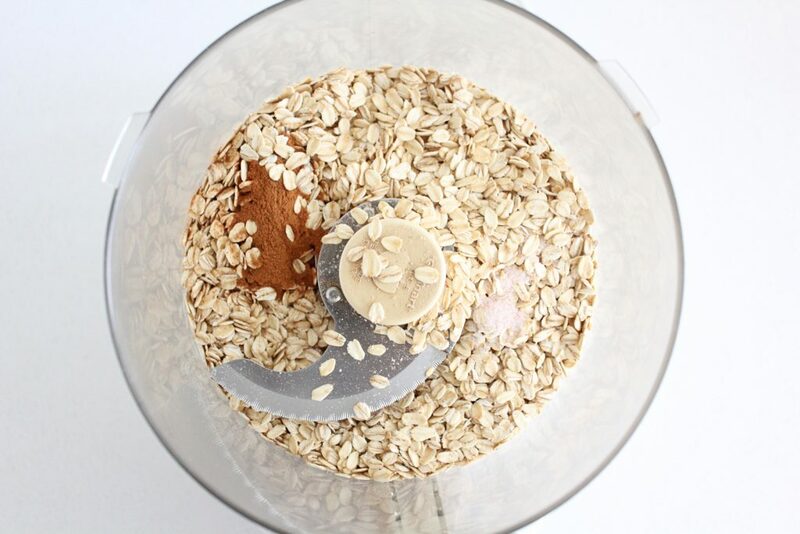 Add the pecans to the oat bowl and add the ground chia too. 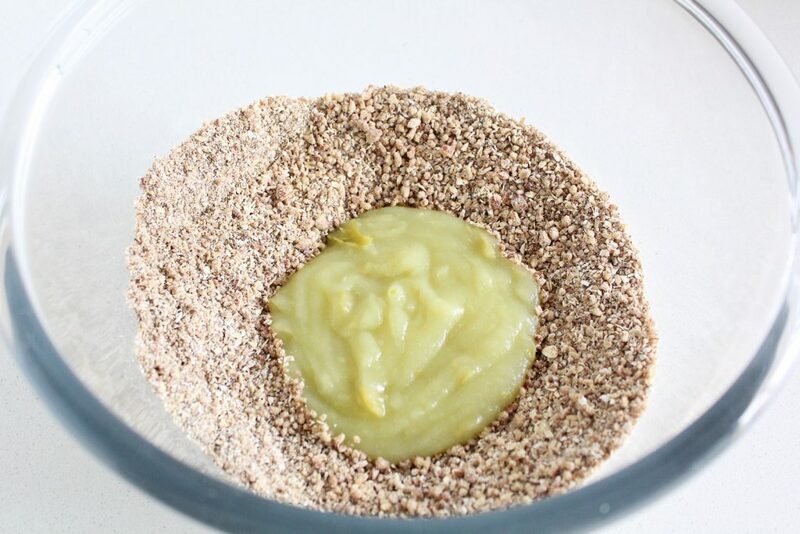 Add the melted coconut oil and apple sauce and mix until well combined. 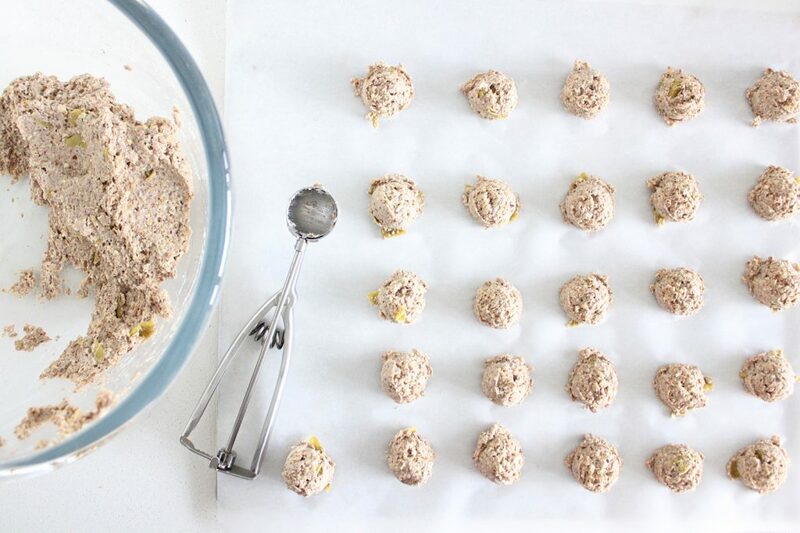 Using a scoop or a spoon (I used a 2 tsp scoop), scoop little balls onto 2 parchment-lined baking sheets. 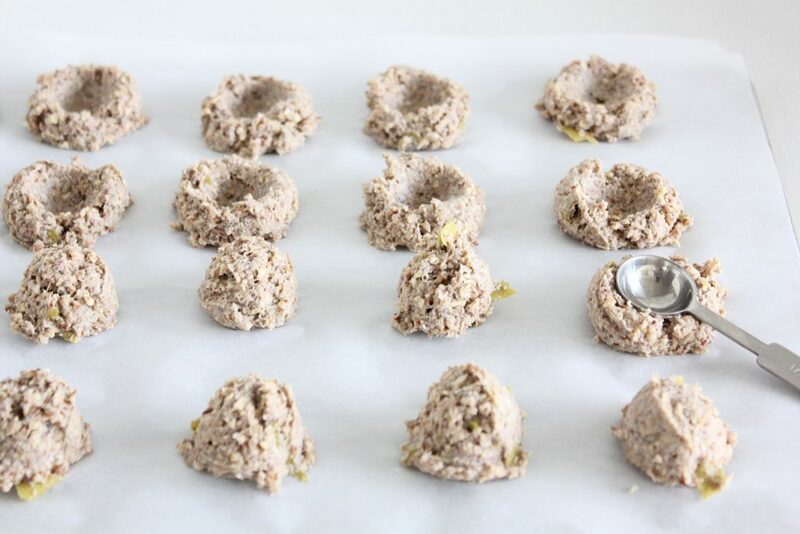 Using your thumb, your knuckle or the round side of a ½ teaspoon, make indentations in the center of the cookies without poking through to the bottom. Bake for 30-35 minutes or until they get golden around the edges and on the bottom. 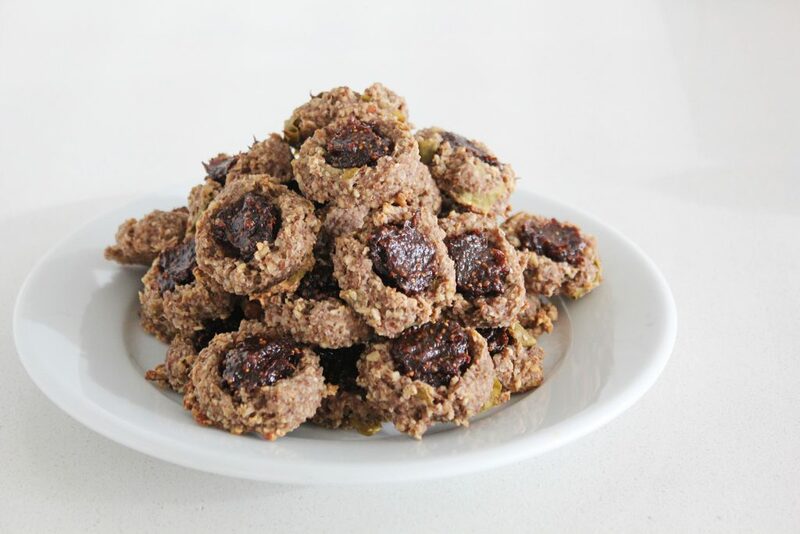 These cookies have a softer, muffin-like consistency. They will feel soft when they come out but firm up a little more as they cool. Store in the fridge for a week or freeze immediately. Remove the core from the apples but leave the skin on and cut into 6-8 pieces. Throw them in a small pot with the water with the lid on top. Bring the water to a boil and turn it down to medium. 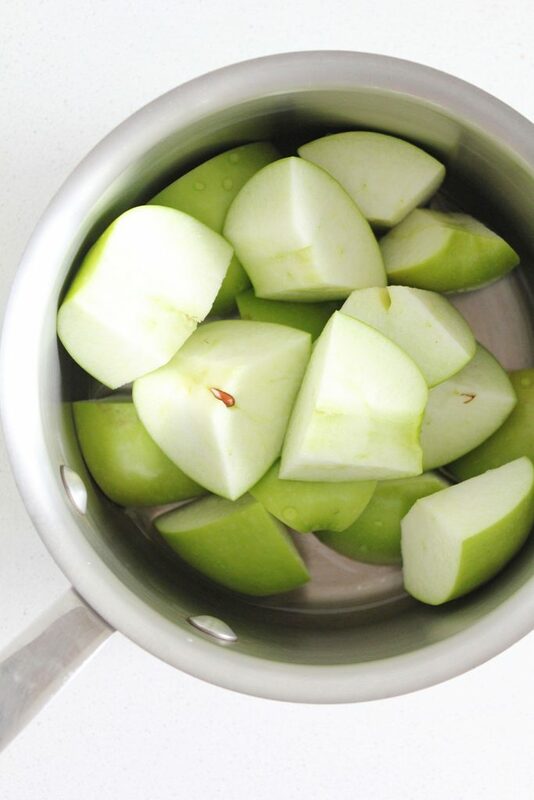 Let simmer for about 5 minutes or until the apples soften. Wait for it to cool (safety) and then dump contents into a blender, or use an immersion blender to blend until smooth (you may still see bits of skin, but that's ok). Use right away, freeze it or it keeps for a few days in the fridge (add a squeeze of lemon juice to keep it from browning).